Le Vieux Murier comprises two buildings, an old stone built former farmhouse and its dairy, which together enclose a delightful private courtyard, perfect for dining under a canopy of vines. An arched portico gives access to the garden and can be closed to prevent small children gaining access to the pool when unsupervised. Both buildings are full of character and have been carefully restored to offer great charm and a high standard of comfort with all modern amenities. Sleeping up to twelve people with ample space and comfort Le Vieux Murier is ideal for large family gatherings - or for 2/3 families sharing a holiday. The House: An open plan area some 40ft in length, kitchen (fridge, dishwasher, hob, oven) to one end with seating beyond the staircase which gives access to the first floor. On the first floor there is the main bedroom (20ft x 13ft) and landing - with floor length windows and bathroom. Two bedrooms occupy the entire upper floor of the house, accessed from the first floor landing. The old tiled staircase enters into the first room (twin beds), beyond which is the second bedroom, again with twin beds. this second bedroom has a bathroom (shower, WC, basin). The Dairy: From the courtyard you enter the kitchen (which also has a dining table). The sitting room can be entered from the kitchen or directly from the courtyard. Tiled stairs at the rear of the kitchen go to the first floor, where all bedrooms have high and sloping ceilings. The small landing gives access to the large double bedroom (own bathroom)- which also has direct access to the courtyard via its own external stone steps. Also accessed from the first floor landing is a twin bedded room. A door from this bedroom gives entry to a large bathroom. Through this bathroom is a further spacious double bedroom - which again can be accessed directly from the courtyard via its own external steps thus avoiding the need to walk through the twin bedded room. The Courtyard: A dining table for 12, with further seating under the canopy of vines. There is an additional WC in the courtyard and the laundry room, with further fridge and deep freeze, washing machine and drier is also accessed from the courtyard. The layout has very much evolved from a need to work within the framework of a very old property and from a wish to retain the charm of that property. All the bedrooms are spacious, light and airy. There is a travel cot/playpen, further cot and a high chair. Swimming pool 10x5m. The House and Dairy are each fully and independently equipped. Great spot, amazing house, wonderful host. We've been visiting Le Vieux Murier for the last 15 years - it get's better every year. The house is in a great location to go visiting the Provence countryside, and then coming back to an afternoon at the pool, followed by a barbecue in the courtyard. “Le Vieux Murier” is an excellent place to spend your holiday. 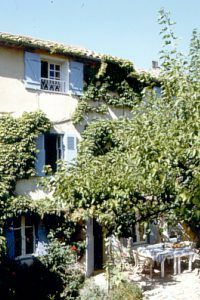 The property itself is lovely and comfortable, close enough to the village of Lorgues, yet far enough for a quiet stay. The owner, mrs. Henderson, is very hospitable and will do anything she can to make you feel at home. We have been there eight times already and I can safely say there will be a ninth time. A fabulous house & dairy and a perfect hostess Judith, she could not be more helpful with all you need to know about the area and lots of hints for things to do and places to visit. The courtyard is lovely for eating lunch or dinner with plenty of shade, and there is also a BBQ. Both the farmhouse and the Dairy are very well equipped and spotlessly clean. Everything you will need is there. The pool and garden are great lots of sunbeds and umbrellas should you need shade, and the garden is very pretty, the only sound is the croaking of tiny frogs in the ornamental pool. After pulling into the drive and shutting the gates behind us, I knew the stay was going to be brilliant. This place accomodates for all. Whether it is a family, a group of familys that want to come away together in a very safe and relaxed environment, or would be great for a group of young professionals wanting a relaxing for week somewhere outside of city life. I would highly recommend this place to anyone and look forward to my next visit. I have been lucky enough to come to Le Vieux Murier over the years on family holidays and it is the most lovely place! Jude is amazing and makes sure all guests are very comfortable. The courtyard is stunning and perfect for al fresco dining. The pool is lovely and peaceful. The house is situated very close to Lorgues so very convenient to pick up supplies. I can't wait to visit again! We have enjoyed very many memorable visits to LE VIEUX MURIER. The marvellous environment created by the house, the planting in the Courtyard and around the pool, encourage us back time after time. We are always welcomed by Judith H, who is a very generous hostess, Bolstered by the thought of sitting in the courtyard with a glass (or two) of the local "pink" is enough to keep us going back, again and again! You really should try it!! The house is situated in the hamlet of Les Salettes, just two miles from the picturesque medieval town of Lorgues and within easy reach of St Tropez and the beaches of the Med. Lorgues is a bustling town throughout the year, with a market occupying all the main street on a Tuesday morning. There is a selection of small shops plus a handful of restaurants and bars. There are also two supermarkets and a wine co-op. The Dairy alone (two double and one twin bedded room, 2 bathrooms) is available for rent throughout the year, excluding the period 26th July to 30th August when the property is let in full. Rental is 1100 Euro per week, Spring and Autumn. Winter rates from 500 Euro. Please contact the owner for further details.